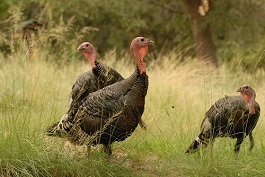 PHOENIX – The deadline to apply for 2018 hunt permit-tags issued through the draw process for spring turkey, javelina, bison and bear is right around the corner. All online and paper applications must be received by the department no later than 11:59 p.m. (Arizona time) Tuesday, Oct. 10. Postmarks do not count. Applicants are encouraged to use the online application service at https://draw.azgfd.gov/ (scroll down to “Apply for a Draw”). Purchasing a hunting license and filling out an application online is fast and easy. The online service also dramatically reduces the chances of making errors that could result in a rejected application. Paper applications now should be hand-delivered to any of the seven statewide department offices to ensure they are received by the deadline (as a reminder, all department offices will be closed Monday in observance of Columbus Day). With the total number of online applicants approaching 90 percent, the department no longer will be staffing an outside “drop box” station for paper applications that are hand-delivered on deadline day. A drop box still will be provided, which can be located by following clearly visible signage. For those who need assistance filling out an application, customer service representatives will be available at all statewide offices until 5 p.m. Tuesday, Oct. 10. Online application assistance only will be offered from 5 p.m. to 11:59 p.m. by calling (623) 236-7424. Applicants must possess a valid Arizona hunting license to apply online for a hunt permit-tag. That license must be valid on the last day of the application period (Oct. 10, 2017). Licenses are valid for one year from date of purchase and can be purchased online at https://www.azgfd.com/license/, as well as at all department offices and license dealers statewide. This also would be a good time for online applicants to create a Game and Fish portal account. A portal account provides VIP access to draw results up to a week before results are released to the general public. It’s quick, easy and free to create a portal account. Visit www.azgfd.gov, click on the “My Account” button in the upper right-hand corner of the home page, then select the “Create Account” option. Another benefit for those who create a portal account is PointGuard. This is a great way to protect those coveted bonus points for when “life happens.” PointGuard is only $5 per species, per applicant. PointGuard ensures if a successful applicant is unable to participate in a hunt for any reason, the accumulated bonus points that were expended to draw that hunt permit-tag will be reinstated. Visit https://www.azgfd.com/hunting/pointguard/, or call (602) 942-3000, for more information about PointGuard. PointGuard can be purchased for 2018 spring hunts through Nov. 2, 2017.